Ministers, steel companies, MPs, unions and trade bodies are to meet in Rotherham today at a top-level summit to discuss the challenges currently facing the global steel industry. Indian-owned steelmaker, Tata Steel has for a long time been warning that continuing cheap imports risk undermining Europe's steel industry and that uncompetitive energy costs and the strength of sterling are hurting its UK operations. In July, the company announced a restructure of its speciality and bar business to focus on high-value markets such as aerospace - a move that has put 720 jobs are at risk, many in Rotherham. Tata Steel said that the bar business in Rotherham has been "underperforming in the face of commodity-grade steel being imported to the UK due to the strong pound and high electricity costs which are more than double those of key European competitors." Talks over a deal for the company's struggling long products division ended recently and the business has now become a standalone subsidiary. Last week it was announced that the coke ovens and blast furnace at (SSI) Redcar steel mill are to be closed after no viable offers were received from potential buyers. Business Secretary Sajid Javid, who will be chairing the summit at the AMP Technology Centre in Rotherham, said: "This is a hugely difficult time for the steel industry across the world – one of the toughest times ever. It is a worldwide problem, and while it will not be solved overnight, we will work closely in partnership with the industry to help find some answers. "There is no magic bullet and we can't change the price of steel, but we can forensically work through all of the challenges we know the industry is facing to see what solutions there might be. We will also continue to do everything we can to support workers and to continue building a strong economy across the country." Roy Rickhuss, General Secretary of the steelworkers’ union Community, added: "Community will play a full and active role in the steel summit. For several years, we have been calling for a government-led steel strategy, which recognises the importance of this foundation industry to the wider UK economy. The current steel crisis is partly a result of such a strategy not existing. This summit will be a positive opportunity for steel businesses, trade unions and the government to come up with a sustainable plan for the future of the UK steel industry as a key part of any wider industrial strategy. "The summit must not be a talking shop. There is a case for urgent, short-term action to help create a level-playing field for UK steel producers. 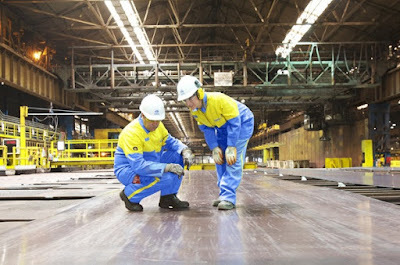 Retaining vital steel making skills should be a priority. Other European countries offer support for short-time working to help retain or upskill steelworkers ready for when the market recovers. The government should explore how this can be done in the UK."